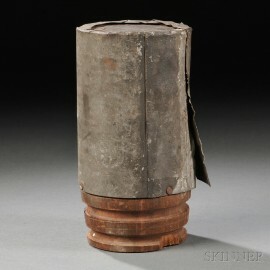 U.S. Six Pounder Canister Shot, c. 1861-65, wooden sabot with two rings, soldered tin casing crimped over an iron disc, ht. 6 3/4, dia. 3 1/2 in. In good condition, with half the soldered edge loose from the sabot up, and a small chip in the sabot.